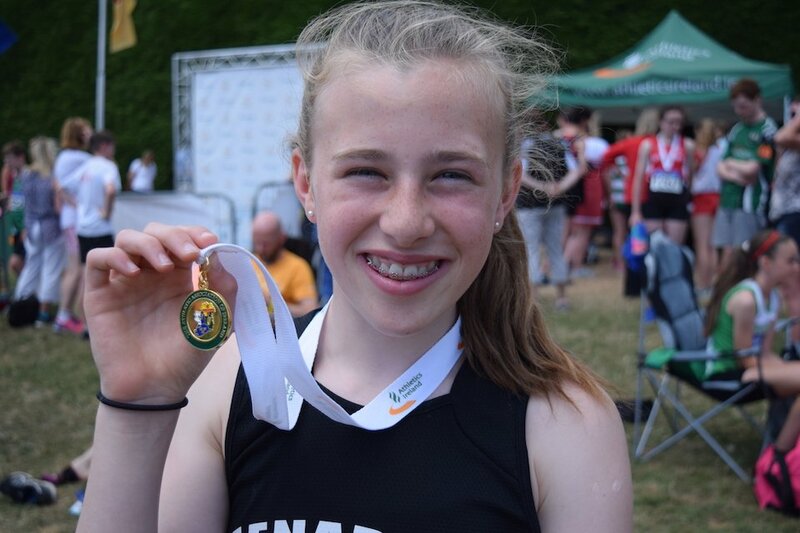 Young athletes from County Wexford last weekend enjoyed one of their best National T&F Championships in some time. Indeed the fine showing at the recent Leinster Championships had indicated that, all going well, Wexford would be a force to be reckoned with at the All-Irelands. Suffice to say that all went well! Conditions were close to perfect with some welcome cloud cover and an absence of wind. Ruby Reynolds (Menapians) opened the account for Wexford as she stormed to a convincing victory in U13 60m Hurdles in a time of 9.65s, just 0.13s off the CBP; Abbie Doyle (Bree) placed 4th (9.91s). Following three fouled throws, Joshua Hewlett (United Striders), in U18 Javelin, saved the best until last as he took the Gold with a throw of 48.56m. Aisling Kelly (Taghmon) is in wonderful shape right now. Having won her heat of U17 100m in 12.46s she found an extra gear and won the final in some style in a PB of 12.28s. This will surely serve as a great boost to her confidence as she heads to the SIAB (Schools International Athletic Board) meet in Glasgow at the weekend. Aaron Tierney Smith (Menapians) placed 2nd U19 110m Hurdles (15.34s). In U17 Long Jump Maeve Hayes (St Paul’s) put in a strong series of jumps, her second round jump of 5.33m being her best. She had the eventual competition winner worried right up to the final jump as they were fairly evenly matched. In the end Maeve was happy to take the Silver. The ever-consistent Gergely Pap (St Paul’s) won U17 Shot Putt with a PB, on his sixth and final effort, of 13.89m. He also placed 4th in Discus (33.42m). Gergely received a late call-up to the Irish team for next weekend’s SIAB meet in Glasgow. Well deserved. Jack Forde (St Killian’s) had a facile victory in U16 High Jump, jumping 1.85m. He followed up with Silvers in both Shot Putt (12.52m) and Triple Jump (12.26m). Myles Hewlett (United Striders) bettered the CBP in winning U14 800m at the Leinsters a few weeks back. He really lit up the track on the occasion as he took off from the pack early and never let up. On this occasion he chose to stay off the front, so allowing the front-runners establish a small advantage. When, on the second lap, he made his move he was moving faster than everyone else. This meant that, come the finish line, he was really flying and had passed all but one of his opponents. So, Silver for Myles in a time of 2:11.40 mins, a few tenths outside his Leinster time. Fine run. Fellow Strider Darragh Flannelly lined up in the U15 800m. One of the county’s most improved young middle distance athletes, Darragh took a more aggressive approach than Myles, moving to the front on the first lap. Into the second lap there were three of them clear of the field and moving away. On the back straight Darragh was relegated to 2nd; around the final bend he slipped back to 3rd; down the home straight and he could sense an attack coming from behind to go with the lactic attack in his legs; the fresher legs pipped him. 4th for Darragh in a time of 2:09.69 mins, a PB by 3 seconds. After all that, he is still one of our most improved athletes. Steeplechase specialist Róisín O’Reilly (Menapians) has been improving with every race. Last Saturday she showed further improvement as she literally ran away with the U17 2000m s/c in a CBP and PB of 7:06.73 mins. The race, which had both U17 and U18 athletes, was a two horse race from the start between Róisín and her Ashford rival Róisín Treacy. The latter set a hot pace from the start which the Wexford girl was happy to go with. Two laps to go and the early efforts were showing on Wicklow Róisín. With nothing other than a lengthening of the stride it was game, set and match to the Menapian lady as she moved ahead for a big win. Both girls will be competing on the Irish team at the SIABs next weekend. Lystus Ebosele (DMP) was an easy winner of U18 Shot Putt with 13.55m the best of a consistent series; Éadaoin Stafford (Adamstown) 5th (10.35m). In Discus Lystus achieved a first round throw of 31.94m, her best of the competition. This was good enough to give her the win with a 19cm winning margin. Éadaoin Stafford placed 5th once again with a throw of 24.60m. Marguerite Furlong (Adamstown) won U19 Discus only clinching the title with her final throw of 32.73m. Amy Forde (St Killian’s) placed 3rd (27.28m). It was a similar story for Marguerite in the Shot Putt as it wasn’t until her sixth effort that she secured the victory (10.67m). Clubmate Zara Power finished in 7th place. Padraig Hore (Taghmon), in his final year at Juvenile level, was, up to the final round, lying 2nd in U19 Shot Putt with throw of 12.77m. A big final effort by long-time rival Patrick Corrigan of Suncroft surpassed Padraig’s best pushing him into the Bronze medal position. In an exciting U14 High Jump competition Orlaith Deegan (SBR) cleared 1.48m to guarantee her the Bronze. She almost cleared 1.51m to challenge for the Silver. However, she was very happy to take the Bronze. Ciara Mooney (Adamstown) placed 6th U14 Javelin (29.20m) and 9th in Shot Putt. Nathan Murphy (Menapians) was 4th in U16 Discus (33.83m). Next Sunday he lines out in his first All-Ireland 1500m. Cosmo Hewlett (United Striders) placed 5th, with a throw of 37.73m, in a very competitive U14 Javelin, an event in which the top three broke the Championship record. The highlight in the Walks from a Wexford point of view was the Gold won by Bridín Doyle of Craanford Harriers) in U14 2k Walk (11:35.48 mins); Isabel Bawden (United Striders) was 3rd (12:16.66 mins). Triona Mooney (Adamstown) won a Silver in U19 3k Walk (16:18.05 mins). Jack Byrne (SBR) won a Bronze in U15 2k Walk. Eve Byrne (United Striders) placed 6th in U16 2km Walk. Saidhbhe Byrne (Enniscorthy) 8th U15 80m Hurdles (12.91s). Kaylem Codd (DMP) 9th U15 Shot Putt (11.24m). Elaine Oladiran (Enniscorthy) 6th U15 Hammer (32.63m) and 4th in Shot Putt (11.11m). Sammy Delaney (St Paul’s) 6th U19 Long Jump (6.00m). Tagged National Juvenile T&F Championships 2018, Wexford athletes at National Juvenile T&F Championships 2018. Bookmark the permalink.